We’ve been counting down the days ’til Samantha Bee’s “Not The White House Correspondents’ Dinner” since it was announced. This “Very Special Episode” of Full Frontal with Samantha Bee was destined to hit us in the sweet spot. Bee’s Correspondents’ Dinner counter-programming pulled out all the stops. Will Ferrell reprising his SNL impersonation of George W. Bush! Allison Janney reprising her West Wing role as press secretary C.J. Cregg. 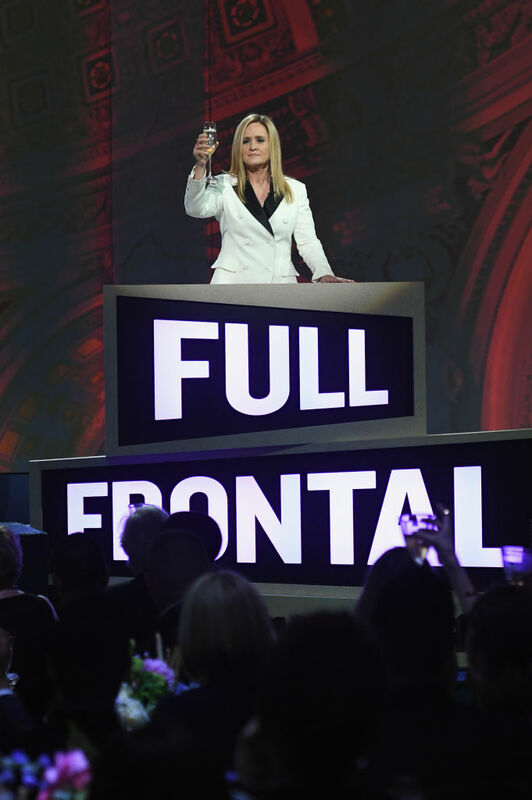 And, of course, the woman of the hour, Samantha Bee herself, throwing down some zingers for the ages. Not only did Bee perform like a dream, she straight-up crushed it in the style department. Because when you’re hosting Anti-Prom For Politics and all eyes/camera lenses are on you, it absolutely behooves you to sell your personal brand in the most stylish way possible. Bee one-hundred percent did just that with one perfect pantsuit. Yup. Pantsuit. We see what you did there, Ms. Bee. We suspect the white’s a nod to the suffragette movement. Many women of yesteryear wore the color while fighting for the right to vote. Though we suspect Bee’s outfit is primarily inspired by a decidedly more contemporary opponent of the glass ceiling. Come on! You were thinking it, too! So yeah, the outfit’s symbolism is open to interpretation. But one thing is for certain – Bee absolutely slays in this suit. We’re particularly obsessed with the black lapels/black pumps. It definitely ties the outfit together without being too matchy-matchy. And just a sleek blowout, neutral makeup, no distracting accessories – the simple styling is perfection in our book.